The City of Glenwood Springs is a Home Rule Municipality that is the county seat and the most populous city of Garfield County, Colorado, United States. The U.S. Census Bureau stated that the city population was 9,614 in 2010 census. 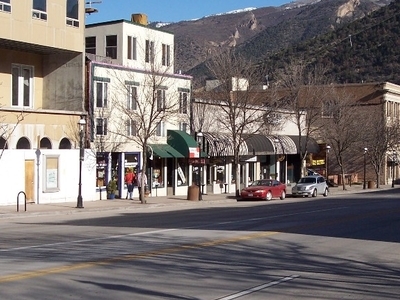 Glenwood Springs is home to one of the campuses in the Colorado Mountain College system. 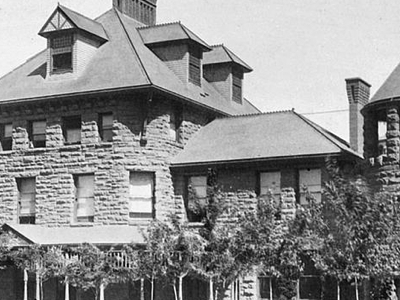 Glenwood Springs was originally known as "Defiance". Defiance was established in 1883, a camp of tents, saloons, and brothels with an increasing amount of cabins and lodging establishments. It was populated with the expected crowd of gamblers, gunslingers, and prostitutes. Town Founder Isaac Cooper's wife Sarah was having a hard time adjusting to the frontier life and in an attempt to make her environment somewhat more comfortable, persuaded the founders to change the name to Glenwood Springs, Colorado, after her beloved hometown of Glenwood, Iowa. Glenwood Springs lies along I-70 at exit 116 (main exit), about 150 miles (240 km) west of Denver. I-70 is one of the main east-west routes through the Rocky Mountains. Amtrak services regularly stop at Glenwood Springs. The California Zephyr operates daily in both directions between Chicago and Emeryville, California (across the bay from San Francisco). Amtrak takes a scenic route through the mountains between Denver and Glenwood Springs. Much of the route follows the Colorado River and is away from roads and major development. Part of the route near Glenwood Springs was used for locations in the 1995 action movie Under Siege 2: Dark Territory, starring Steven Seagal. Glenwood Springs Airport, a municipal airport, was built in the early 1940s. Its airport code is KGWS. The airport was also named the 4th most challenging mountain airport by the Aircraft Owners and Pilots Association (AOPA). The main reasons cited were the airport's mountainous location, the runway, and the unpredictable wind gusts, which caused a crash in 2007. In 2004 a Cessna crashed into an apartment near the airport due to engine problems. The city provides snow plow operations in the winter. Due to noise concerns, runway 14 is recommended for take-off, and 32 for landing. Currently, 73 planes are based on the field. Roaring Fork Transportation Authority provides bus transit in Glenwood Springs and throughout the Roaring Fork Valley. The city also operates an intracity bus service, Ride Glenwood. Ride Glenwood offers a main route from the west side of town along the 6&24 corridor, through downtown, to the south part of Glenwood along Hwy 82. Outdoor recreation opportunities in Glenwood Springs abound; many visitors choose to have their experiences arranged by an outfitter. Activities include whitewater rafting, kayaking, cycling, rock climbing, horseback riding, all-terrain vehicle (ATV) tours, off-road Hummer tours, Segway tours, World-class fishing, and lodge stays in Glenwood Canyon. 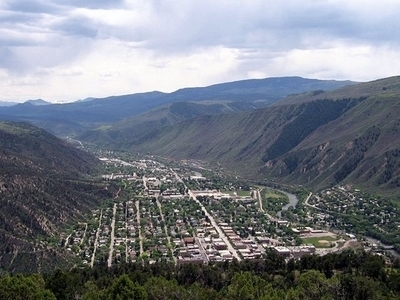 Glenwood Springs lies about 45 miles (70 km) north of Aspen and 60 miles (100 km) west of Vail. There are 6 world-class ski resorts in this triangle: Aspen Mountain, Snowmass, Aspen Highlands, and Buttermilk in the Aspen area and Beaver Creek and Vail Mountain in the Vail area. There is also a family ski resort 10 miles (16 km) from town, Sunlight Mountain. Another ski area, Red Mountain, existed until the mid-1900s. Some of the ski lift towers can still be seen. Nowadays the old service road acts a hiking trail. Two rivers, the Colorado River and Roaring Fork River, converge in Glenwood Springs. Both are used extensively for recreation by locals, visitors and commercial outfitters. The waters of the Roaring Fork are "Gold Medal" fishing waters. There are quite a few noted mountain bike trails in the Roaring Fork Valley, all requiring fitness and stamina. The favored routes for locals are the Forest Hollow Trail that winds along the rim above Glenwood Canyon and the Scout Trail, an extreme drop from the canyon rim into downtown Glenwood. Red Mountain, also known as the Jeanne Golay Trail, is a dirt trail up Red Mountain that locals use for training and exercise. Glenwood Springs is home to a 9-hole golf course referred to by locals as "The Hill" and is within driving distance of mountain golf. One golf club received Golf Magazine's "Best of America's New Courses" list. The 16 miles (26 km) long recreation trail through Glenwood Canyon is sandwiched between the canyon walls and the Colorado River. It is suitable for families and recreational riders, with several access points and rest areas along the way. Bike rentals and shuttles are available at several outfitters in town. There is a paved loop along the Roaring Fork River that takes you from one end of town to the other and back again. A tram takes visitors up to what was formerly called the "Fairy Caves", now known as the Glenwood Caverns, which also has a recreation complex. It includes North America's first Alpine roller coaster, and a Screamin' Swing called the "Giant Canyon Swing", which swings riders out over the edge of Glenwood Canyon, looking down at the Colorado River 1,300 feet below. Hanging Lake is located in Glenwood Canyon about 7 miles (11 km) east of Glenwood Springs. The lake is reached via a trailhead located near I-70 in the bottom of the canyon. In the summer of 2010 the boardwalk at the lake was replaced. Yampah hot springs vapor caves are historic underground steam baths. They are over 100 years old and were used by the Ute Indians as a source of rejuvenation and healing. Today, the vapor caves consist of three adjoining underground rock chambers. Cave temperatures average 110 to 112 °F (43 to 44 °C). The hot springs and mineral caves are tourist attractions and were a main reason for the settlement of Glenwood Springs. Here's the our members favorite photos of "Cities in Colorado". Upload your photo of Glenwood Springs!